HOMANN -Recentissima Asiae Delineatio. . .
HOMANN,J.B. - Recentissima Asiae Delineatio. . .
Recentissima Asiae Delineatio. . . - HOMANN,J.B. Title : Recentissima Asiae Delineatio. . .. Size : 18.9 x 22.4 inches. / 48.0 x 57.0 cm. 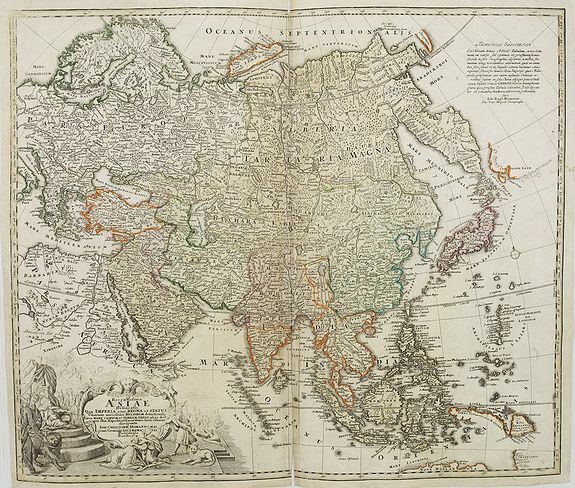 Description :A fine example of this detailed map of Asia showing the outlines of New Holland, Terre des Papons, Nova Britannia and Capentaria. The cartouche shows a Sultan on his throne with his subjects. The title is surrounded by scroll work and floral decoration. Condition : Some light browning and a marginal water staining. Split along center fold.